Piazza Savonarola is large rectangular square that was built in the 19th century. 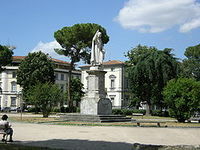 The piazza was dedicated to a Ferrarese friar and a statue for him was built in the square by Enrico Pazzi Ravenna, the same sculptor who built the statue of Dante in Piazza Santa Croce. He sculpted the statue in 1872 and until 1921 it was located in the Salone dei Cinquecento in Palazzo Vecchio before being transferred to the piazza. The statue is characterized by the profound expression of the monk who is holding a golden cross. The surrounding garden of the piazza is paved and surrounded by six large flower beds that cover an area of 3177 square meters; there are pines, linden, cedar, cypress and high horse-chestnut trees, as well as some pink flowers. The street lamps are made of cast iron from the late 19th century, and were originally used with gas lighting before being converted to electric lighting. Today the square is characterized by a certain homogeneity in the style of the buildings surrounding it and it is a pleasant corner of the city. There are some buildings of considerable merit, such as the Galleria Rinaldo Carnielo, now a museum, which is an example of Art Nouveau. This whole area, up to Piazzale Donatello, was still popular in the 19th century for the studios of many artists. The northwest side of the piazza is occupied by the church and monestary of San Francesco. The structure, built to house the Carmelite nuns "evicted" from the convent of Santa Maria Maddalena de 'Pazzi, dates from 1887. In 1928 the structure was passed on to Franciscan monks, who sbsequently renamed the church to its current name. Opposite the church stands the Florentine headquarters at Syracuse University. At the corner of via Leonardo da Vinci and is a 19th century palace which houses the Italian Department of the University of Florence, which has numerous frescoes on its ceilings. The plaza is a crossroads for the many transport lines that connect the urban areas of Campo di Marte, Coverciano and Settignano with the center of Florence. Since the end of 1999 work has been underway for the building of an underground parking lot. This construction led to a more general plan for the redevelopment of the square, including new irrigation, the renovation of benches of stone and brick, repaving, tree planting, eradication of hedgerows, and the construction of a public toilet. The garden of the square is perfect for spending a lazy afternoon and in the evening the square becomes a meeting place for young people.